Our Education aspiration is to ensure that every child graduates from high school college or career-ready. Education is key to economic growth. People with limited skills and competencies are often excluded from higher wage jobs and have fewer prospects for advancement. Additionally, research shows that success in school is tied to higher quality of life measures, such as health and civic engagement. How are we Moving the Needle? Currently, Collaborative Action Networks are focused in three areas: attendance, literacy, and career readiness. A combination of policy, professional development, technical assistance, and continuous improvement projects are being implemented. Our Education Action Team is co-facilitated by Bridging Richmond. 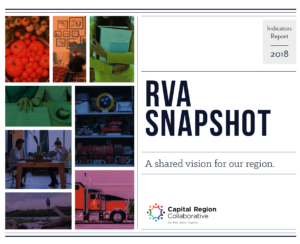 Bridging Richmond’s Education Data Project collects real-time data on educational indicators for the Richmond community. The Virginia Department of Education tracks school performance with the School Report Card.